The combustible gas leak detector with visual leakage indicator, can detect gas leakage. Portable detector for detecting all combustible gas. Detection Gas: Combustible Gas. 1 Combustible Gas Detector. Features: Portable, Gas Leak Detector, Light/Sound Alarm. 1 x Gas Detector. Visible flashing red LED and audible alarm signal. Induced gas including natural gas/LPG/LNG. Due to the light and screen setting difference, the item's color may be slightly different from the pictures. You can use the detector to detect the formaldehyde, and it can keep you safe and healthy. 1 Formaldehyde Detector(Not Include Battery). The detector is made of ABS, and it is safe and non-toxic. It is lightweight and portable, easy to carry. Multi-layer filtration anti-interference, multi-layer micro-pore filtration, effectively eliminate the interference of ethanol, carbon monoxide, etc. Using dry battery protection technology, the life of the whole machine is up to 10 years. Airradio CH4 LPG gas detector C2 adopts high quality gas sensor and advanced technology. When the CH4 gas concentration in the air reaches 150ppm, the detector will issue an visual and audible alarming promptly to protect your family's life and property safety. Multipurpose in air quality detection in PM1.0, PM10.0, PM2.5, AQI, temperature, humidity, particulate matter. 1 x PM2.5 Air Quality Detector. High sensitivity sensor ensures the high accuracy in data collections. Air Quality Monitor HCHO TVOC Formaldehyde Detector Humidity Temperature Tester. • Detection of TVOC and benzene. • PM10 monitoring. • PM2.5 monitoring. 1 x PM2.5 Detector. • Detection of formaldehyde. The Carbon monoxide gas detector is a portable detector for detecting carbon monoxide (CO) gas. Portable detector for detecting carbon monoxide(CO) gas. High precision portable CO gas tester with compact size and light weight is easy to carry and operate. Detection Range: formaldehyde (0.000-1.999 mg / m³), TVOC (0.000-9.999 mg / m³). 1 x Formaldehyde Detector. Can help analyze air quality and detect HCHO and TVOC. Accuracy Standard: 0.001. Large LED display screen, clear and convenient for your reading. 1× CJMCU-8118 CCS811 HDC1080 Carbon Monoxide CO VOCs Temperature Humidity Air Quality Sensor Detect Module. Relative humidity accuracy: 2% (typical). Excellent stability under high humidity. Arduino Module. 1 Xiaomi Zhimi PM2.5 Detector. It is Xiaomi ecological chain products (smartmi). There is no Xiaomi logo on it. Green orange red three-color digital indicator. ABS material,excellent hand feel,sleek shape ,small and portable. 6 in1 Air quality Detector Formaldehyde Detector pm2.5 Tester HCHO PM2.5 PM10 Gas Analyzer Tool Air Quality Detector. - TVOC /HCHO /PM2.5/ PM10 /Temperature / Humidity 6in1 multifunctional air quality detector,with stand, Large LCD Color Screen easy to read the testing result, more convenient to use for indoor air detect. Formaldehyde: 0.000~1.999 mg/m3(formaldehyde). Detection range: formaldehyde (0.000-1.999 mg / m³), TVOC (0.000-9.999 mg / m³). 1 x formaldehyde detector(not included battery). (2) Turn on the power switch, the detector starts to preheat and LED screen will display the count-down. Type:Combustible Gas Leak Alarm Detector with Relay Output. It can be used standalone. 1 x Gas Leak Detector. Auto reset after alarm. Alarm Output: relay output/sound & flash alarm. Alarm Indicator: red LED fLash. parameter: Operating voltage: 220V Alarm current: 100 (MA) Static current: 20 (uA) Detection angle: 360 degrees Detection distance: 2(m) Working temperature: -10~50(°C) Installation method: wall-mounted Product weight: 120g Size: 110mm*60mm*40mm Carton size: 56cm*46cm*32cm Scope of application: Gas, natural gas, liquefied petroleum gas leak alarm Features: 1. Using patented gas sensor, no passivation phenomenon, lower power consumption and longer life; 2, unique design, can induce gas, natural gas, liquefied petroleum gas; 3, imported chip machine intelligent control, self-detection, to prevent false positives, to prevent missing reports, stable and reliable; 4, can be used alone, can be used with the control system network, but also can connect the exhaust fan, solenoid. Able to detect formaldehyde in the indoor air. 1 Formaldehyde detector, 1 Chinese manual. Suitable for detection of new furniture & decoration, living room,office, etc. Application scope: Household, indoor. When the battery is low, a beep sounds every 30 seconds will be produced to remind you to replace the battery. Protect your family from carbon monoxide hazards, suitable for or any sleeping area of your bedroom and living room. 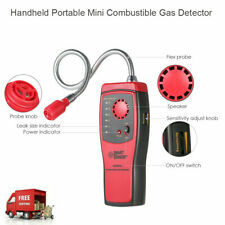 Portable detector for detecting all combustible gas. Detection Gas: Combustible Gas. 1 Combustible Gas Detector. Audio & visible leakage alarm indication and adjustable sensitivity. Instant response, pinpoint leak position and low battery indication. The gas leakage detector adopts high-quality semiconductor calefaction type sensor, which can provide good performance. Features: Safety Alarm, Gas Detector, Sensitive, Practical. Detection of Gas: Natural Gas, LPG, Coal Gas. 1 x Air Detector. We would try our best to help you solving any problem. Color: White. - Due to different displays and different lighting, the image may not reflect the actual color of the project. - Product details may vary due to different production batches. 0.000-9.999mg/m³ (TVOC). -Detailedly analyze air quality in your surrounding and detect PM2.5, PM10, formaldehyde, TVOC,AQI, temperature & humidity to prevent any respiratory disease. - Formaldehyde detection. Type: Xiaomi Smartmi PM2.5 Detector. 1 x Xiaomi Smartmi PM2.5 Detector. One-button operation, simplify design. Features: Mini Size, Portable, LED Screen, Three-color Indicator, Battery Powered. Green orange red three-color digital indicator: When the green light is on, the air quality is excellent; When the orange light is on, it indicates mild air pollution; When the red light is on, it indicates heavy air pollution. 1 x Gas Leakage Alarm. Alarm current: <50 ma. Battery-powered 9V Battery(not included). Detail Image. Canada, United Kingdom, Austrilia, France, Germany, Spain, Ireland, Italy, Others. Do not install it in the air vents air quantity Liquidity big places. High quality gas detecting alarm sensor, sensitive in detecting coal gas, natural gas, liquefied petroleum gas leakage. Alarm Gas Density: 0.1-0.5% for Coal Gas, 0.1-0.3% for Natural Gas, 0.1-0.2% for Liquefied Petroleum Gas. This detector detects Formaldehyde(HCHO), TVOC, API. TVOC Monitoring Range: 0.001-9.999. HCHO Monitoring Range: 0.001-3.888. 1 x Formaldehyde Detector. Portable to monitor air quality. Due to the difference between different monitors, the picture may not reflect the actual color of the item. Stable Non-Dispersive Infrared (NDIR) Sensor for CO2 detection. Leak Detector. Ozone Generator. It also allows you to set 2 limits, upper limit or the maximum CO2 concentration and the lower limit or the normal CO2 concentration level. Function:HCHO, TVOC, PM1 / 2.5 / 10. TVOC test range: 0~9.999 mg / m3. HCHO test range: 0-1.999mg / m3. Press and hold the “mute” button for 2 seconds. Press this button again for 2 seconds., and then directly into the indoor testing.